Arsenal fans have thrown their weight behind Alex Iwobi for his display against Chelsea last weekend. The 22-year old youngster gain more fame for creating the club first assist of the season before scoring an equaliser in the 41 minute of the game. Since then, the club fans have started building title hope on the star boy as various supporters took to the club fans page, justarsenal.com to expressed their happiness. The 2017 F.A Cup winner however has vowed to keep showing class under new manager, Unai Emery. 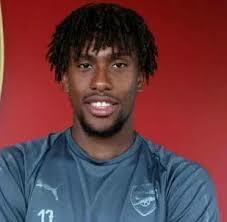 “We were on a high,” Iwobi said. “The message was to keep it going, keep our head and don’t lose ourselves. We fought hard for him. “We enjoy training, everyone is buying into his ideas. It all takes time, a new manager, a new system and the fans and players know that.” Iwobi stressed. The youngster, who recently signed a new “long-term” contract with the club, will certainly be eyeing his first 2018/2019 English Premier league victory as they host West Ham United on Saturday.